Craig Ogilvie was finally able to celebrate his maiden victory as Harrogate Railway boss after Lewis Riley struck late against Barton Town. Saturday's 3-2 success at Station View was just the Starbeck club's second this season and first in 21 outings under their current manager, but, crucially, lifts them out of the NCEL Premier Division relegation zone. "It's a big relief, to be honest. A weight has been lifted and it's nice to get it off our backs," Ogilvie said. "We've had this hanging over us for a while, and we've come close on a number of occasions so I'm pleased that we've finally got the win. "The best thing about it was to see all the players, even the substitutes who didn't play a minute on Saturday, all celebrating together when our third goal went in. "That kind of spirit and togetherness is going to be so important going forwards and hopefully this three points kick-starts something for us." 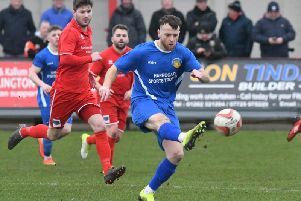 The club's only other victory this term came at Bottesford Town back in August, yet Ogilvie has been making steady progress since replacing Brian Davey at the helm at the start of September. They were unbeaten in five games prior to a narrow defeat to Handsworth Parramore last time out, and the Rail chief felt that it was only a matter of time before his players turned one of a series of promising performances into three points. "It has been coming. This is a result that is definitely overdue," he added. "The way we have been playing over the last six weeks I feel we've deserved a win somewhere along the line. "It's a big three points because we go above Hall Road Rangers and the manner that it arrived in - a goal with just 34 seconds left before the final whistle - makes it even better. "We all enjoyed ourselves on Saturday night but we won't get too carried away. 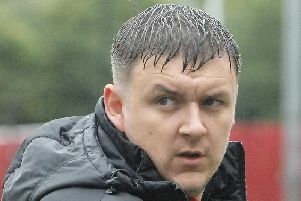 We've still got a big job on our hands to try and stay in this division, starting at Garforth Town this weekend." It was Barton who struck first on Saturday afternoon, Gareth Barlow scoring with a 34th-minute diving header after the home defence failed to clear Will Waudby's corner. Railway were level within seven minutes, however, Thomas Marsden firing an effort through a crowded penalty area and past Sam Riches in the Town goal. Frazer Lancaster then applied the finishing touch to a well-worked team move to put the hosts 2-1 up, though they were indebted to gloveman Mat Zaniewski for an excellent save to deny Eddy Birch from close range in the 73rd minute. The visitors did however manage to level things up soon afterwards, Eddie Rogerson curling a fine effort into the top corner from the edge of the box. Barton's Tom Bennett was then sent off for a second bookable offence and although both teams had chances to grab a winner in the closing stages, it was the Rail who took theirs, deep into stoppage-time. Riley received the ball inside the Town area and turned before sending a strike beyond Riches, sparking wild celebrations. Victory sees Railway leapfrog Hall Road in the league standings and into 18th place ahead of Saturday's trip to Garforth, 3pm kick-off.